For more than two decades, Terry Pratchett has been regaling readers with tales of Discworld—a flat world balanced on the backs of four elephants, which are standing on the back of a giant turtle, flying through space. It is a world populated by ineffectual wizards and sharp-as-tacks witches, by tired policemen and devious dictators, by reformed thieves and vampires who have sworn to drink no blood. It is a world that is vastly different from our own . . . except when it isn't. 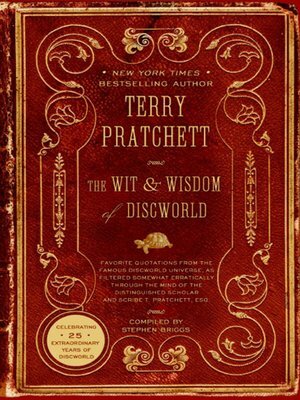 Now, in The Wit and Wisdom of Discworld, various nuggets of Pratchett's witty commentary and sagacious observations have been compiled by Pratchett expert Stephen Briggs, a man who, they say, knows even more about Discworld than Terry Pratchett.
. . . and more! Culled from all the Discworld novels, The Wit and Wisdom of Discworld confirms Pratchett's place in the pantheon of great satirists and proves why the Chicago Tribune has praised his Discworld as "entertaining and gloriously funny . . . an accomplishment nothing short of magical."